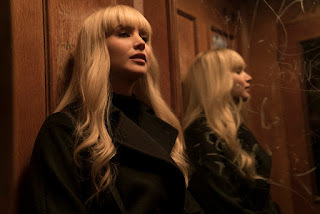 Rotten Tomatoes Plot: Dominika Egorova (Jennifer Lawrence) is many things. A devoted daughter, determined to protect her mother at all costs. A prima ballerina, whose ferocity has pushed her body and mind to the absolute limit. A master of seductive and manipulative combat. When she suffers a career-ending injury, Dominika and her mother are facing a bleak and uncertain future. That is why she finds herself manipulated into becoming the newest recruit for Sparrow School, a secret intelligence service that trains exceptional young people like her to use their bodies and minds as weapons. After enduring the perverse and sadistic training process, she emerges as the most dangerous Sparrow the program has ever produced. Dominika must now reconcile the person she was with the power she now commands, with her own life and everyone she cares about at risk, including an American CIA agent (Joel Edgerton) who tries to convince her he is the only person she can trust. Directed by Francis Lawrence. Dominika’s uncle proclaims "There are no accidents." If Red Sparrow isn't an accident, what is it? A chance to ogle Jennifer Lawrence in the buff? A poor man's cross between Black Swan and Jack Ryan: Shadow Recruit? One of the worst spy movies ever? Da, da and da. In addition to being overlong (140 minutes) Red Sparrow is boring, confusing and (in the parts you do understand) predictable, with some of the lamest Russian accents ever uttered on film. Toss in lousy chemistry between Lawrence and a practically sexless Edgerton, and it's a wonder this sparrow ever took flight.